Between the years of 2001 and 2007, approximately 21,000 United States military personnel were wounded in Iraq and Afghanistan. Thanks to medical advances, soldiers’ odds of survival have risen dramatically. According to an article on the American Academy of Orthopaedic Surgeons’ website, improvements in military medical care, combined with advances in body and vehicle armor, have increased a wounded soldier’s survival rate to 90.4%, a significant improvement over the estimated 76.4% survival rate during the Vietnam War. However, one of the challenges of this increased survival rate is the increased need for pain management in the military. The treatment of soldiers’ pain, both during and after recovery, has been in the forefront of many discussions lately. An article on this topic was recently printed in the Journal of Rehabilitation Research and Development (JRRD), which is published by the Department of Veterans Affairs. The emergency phase includes care immediately after an injury and all the care administered until the injured individual is stabilized. Next is the acute, or healing, phase. This is when all surgical interventions take place. The final phase of trauma care is rehabilitation, which is the period of recovery from the completion of surgical interventions to the full restoration of function. The Secretary of the Department of Veteran Affairs has designated four primary facilities for treatment of veterans and active duty military personnel. These facilities, called Polytrauma Rehabilitation Centers (PRCs), provide inpatient therapy, ongoing medical care, and family support. Pain management has been identified as a very important component of rehabilitation. The James A. Haley Veterans’ Hospital PRC in Tampa, Florida (Tampa PRC) is one of the facilities designated to treat both veterans and active duty military personnel. At Tampa PRC, 98% of soldiers experienced at least one pain problem during their rehabilitation. The most common way of managing pain during rehabilitation is medication use. Opioids, non-steroidal anti-inflammatory drugs (NSAIDs), and anti-convulsants are the most frequently prescribed medications, with opioids in the lead. Approximately 58% of Tampa PRC’s pain patients have been prescribed opioids. While Tampa PRC does attempt to reduce soldiers’ reliance on opioids, just 10% of those utilizing opioids in the rehabilitation facility have completely stopped their opioid usage by the time of discharge. In other words, there is a high rate of lingering pain among soldiers. 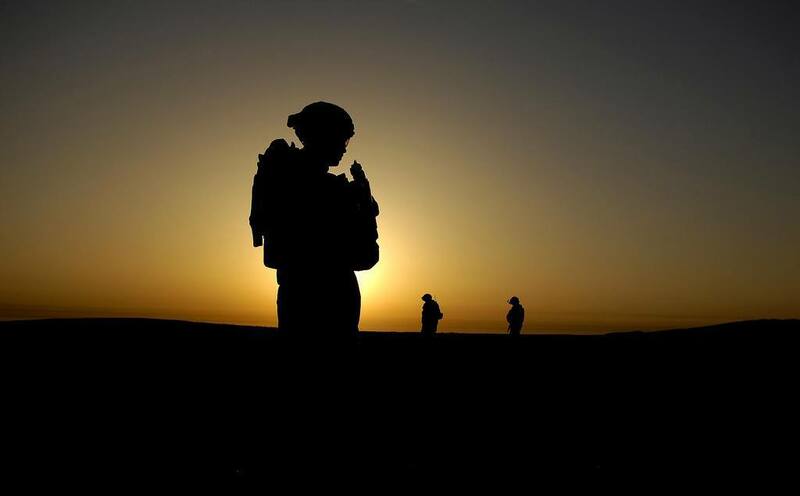 Combined with the high rates of mental health problems, which are strongly linked to chronic pain, this creates a very high risk for the development of chronic pain in the military. As evidenced by a recent study, this risk for chronic pain in the military is beginning to be quantified. In this study, which was published by JAMA Internal Medicine, 2,597 service members were surveyed three months after returning from Afghanistan. Of these soldiers, 44% reported having chronic pain, or pain that’s lasted for at least three months. Obviously, military personnel are at a higher risk for injury than the general population, so an increased amount of pain is expected to some degree. This, however, is significantly higher than the estimated occurrence of chronic pain among the civilian population, which is between 26% and 33%. This prevalence of chronic pain in the military has led to a relatively high rate of opioid use. Of the 2,597 soldiers surveyed in this study, 15.1% reported use of opioids in the past month. Compared to the estimated past-month use of opioids by civilians, which is 4%, this is alarmingly high. Although the use of illegal drugs is lower in the military than among civilians, the rate of prescription drug abuse is higher in the military than in the civilian population. According to the National Institute on Drug Abuse, the number of pain medication prescriptions written by military physicians quadrupled between 2001 and 2009. The reported incident of opioid abuse by service members has increased from 2% in 2002 to 11% in 2008. To curb this disturbing trend, the military is putting new emphasis on alternative and interventional pain management techniques. The Carl R. Darnall Army Medical Clinic (CRDAMC) in Fort Hood, Texas, has a pain clinic that specializes in the treatment of chronic pain in the military. While medications may still be used as part of the treatment for soldiers, the CRDAMC utilizes comprehensive pain treatment plans in which medication is only one tool. Conservative therapies, such as physical therapy or transcutaneous electrical nerve stimulation (TENS), are used, in addition to interventional therapies like steroid injections or nerve block injections. Dr. Richard Erff, chief of the pain clinic at CRDAMC, reports that these comprehensive pain treatments have allowed the Army to achieve a 90% battlefield retention rate, meaning that 90% of soldiers’ pain is treated effectively enough to allow them to return to active duty. One soldier treated at the CRDAMC Pain Clinic was unable to walk 20 feet because of chronic pain after a traumatic brain injury in Iraq. After a few months of treatment at CRDAMC, he is now able to walk for 20 minutes and even helps with chores when he’s at home. With the military’s focus shifting to alternative and interventional pain management instead of dependence on medications, the number of soldiers abusing pain medications will hopefully fall. Additionally, the men and women who protect the United States will hopefully be able to live with less chronic pain. Have you known any military personnel with chronic pain?